Tried very hard on my own through various resources and researched as best I could on this forum. I haven't found the answer I need just yet. Here is my problem. I have run 1Password over many years on an early Macbook Pro, successfully migrated to a later Macbook Pro (the one I am trying to migrate from) to an iMac (which I am trying to migrate to). My Macbook Pro (10.6.8) backed up to Dropbox, until Dropbox became incompatible with 10.6.8. I continued using 1Password until I bought a newer computer - the aforesaid iMac running Sierra 10.12.6. 1Password, was version 3, on 10.6.8, is now version 7, on 10.12.6. It seems to work fine except it seems to have loaded the OLD data from Dropbox, not the latest, which is understandable. So my question is, as my old computer does not talk to Dropbox how can I transfer the latest data from my old Macbook Pro to my later iMac? If you are not able to use cloud sync on your old computer, have you tried exporting your data and importing it manually on the new computer? Once it's there, it will be synced again automatically through Dropbox, so the issue here is only to move the missing data I think. thank you for your suggestion. However, I think I may need some more guidance. On the Macbook Pro 10.6.8 1Password version 3 I went to File>Export>1Password Interchange File and saved the file to a USB stick. On the new iMac 10.12.6 1Password version 7 I went to File>... but import was greyed out - i.e. not available. Is 1Password 7 currently unlocked? Yes it is unlocked. (By that I assume "unlocked" means I can open the application with my master password). However, when I start up 1Password 7 it asks me to pay (again) or provide a license. Clicking on the license "We have those too" button only provides a blank page. Another option is to sign in. This asks me for a "Sign in address", an "email address", a "secret key", and a "master password". I can provide ALL of the above but NOT the secret key. Research has told me that I will have a secret key in certain circumstances - like buying from the Apple store for instance. I didn't buy my 1Password from a third party vendor I bought it directly from agile. So I have been stumped by not having a "Secret Key". @sydman: You will only have a 1Password account with a Secret Key if you have subscribed to a 1Password membership. If you bought the 1Password app, you won't have that. The license link is just trying to open a web view to the store to purchase. It sounds like that page isn't loading for you because your browser is out of date, along with your OS. Does it work after updating? Hi, thanks for the suggestions. Both of my browsers are completely up to date. I run Sierra 10.12.6. The latter is not going to change. I need to move my 1Password version 3 data from Macbook Pro (10.6.8) to an iMac (10.12.6) using 1Password Version 7.
as a matter of interest, on my 1Password version 3, when I click on the 1Password > License menu I am given the option to enter my license manually. I was supplied with the license from Agile via email. On 1 Password version 7, when I click on 1Password > License menu I am presented with a "Browse" feature to look (I am guessing) for a file which is some form of certificate. I am speculating, of course. Perhaps you might suggest an answer. Finally, I notice 1Password 7 is in read only mode and requires a license. Perhaps this is the problem. So before we tackle how to transfer my data we might tackle how to prove to V7 that I have a license. @sydman - you've narrowed it down, yes -- and while you do indeed have a licenes, you don't have a license for 1Password 7 for Mac. Your license sounds like it is for 1Password 3 for Mac, which was first released in 2009, (an amazing) TEN years ago -- thanks for having been one of the earlier adopters of 1Password! However, as the times change and (especially in the computer world), the old becomes the incompatible rather quickly, it's now time for a new purchase for this new version, as 1Password 3 for Mac is increasingly unstable on newer devices and versions of macOS. Clicking the indicated "Need a license? We have those too" link should get you to our FastSpring store where you can still purchase a standalone license for 1Password for $49.99 (which is currently over 23% off the full retail price of $64.99). 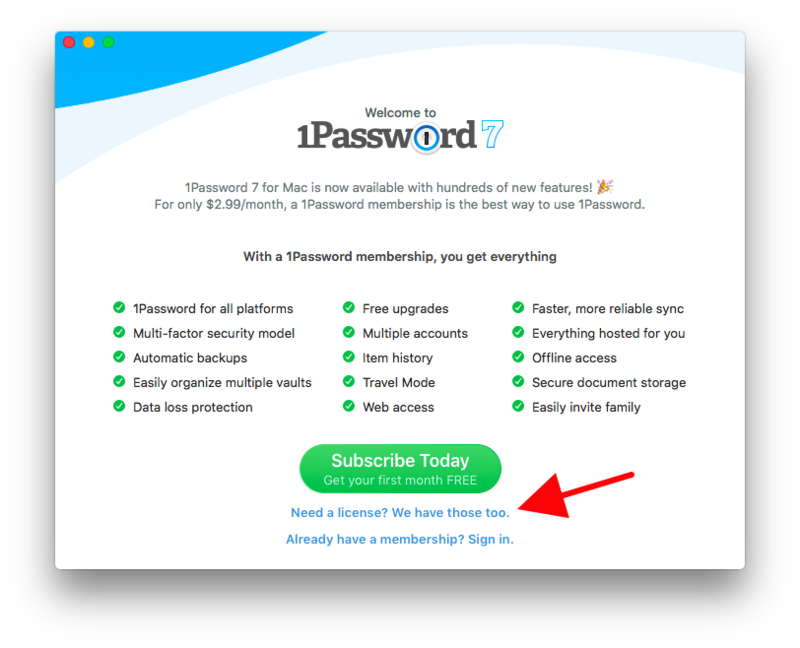 However, I'd be remiss if I didn't suggest the much-better way of using 1Password in the modern era, which would be clicking the large green button just above that link to try a free 30-day trial of a 1password.com membership. If it's just you using 1Password, an individual membership is $35.88USD annually (works out to $2.99/mo), or if you have family members who also want to use 1Password and with whom you want to share data, then a 1Password Families membership is only $59.88/yr ($4.99/mo) for up to five people in the household, which is the best deal we offer by a long margin if you have four or five people. Either way, the benefits are substantial in comparison to standalone 1Password of old. However, the choice remains yours. Once you've decided which way you want to go with regard to that question, let us know and we can help you get the old data into the new setup. Cheers! Thank you so much. All sorted. Excellent! Thanks for the update. On behalf of Lars, you are most welcome! I'm glad to hear that all is well. It sounds like you should be all set, but don't hesitate to reach out if we can be of further assistance. We're always here to help!